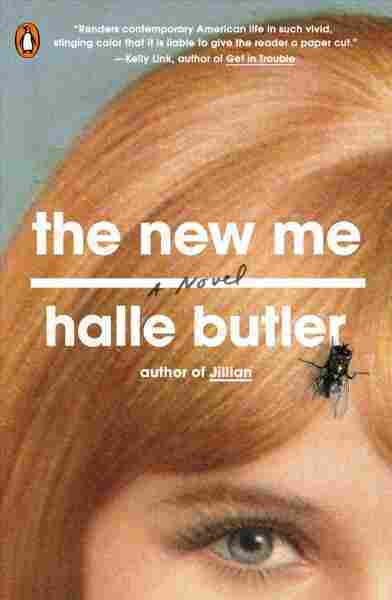 'The New Me' Is Meh About Ambition And Adulthood Halle Butler's new novel explores what it's like to work in a dead-end office job. Her satirical story focuses on a 30-year-old woman named Millie who wanders from temp job to temp job. Once, when Halle Butler was working as a temp, she was taken to a file room filled floor-to-ceiling with old documents and told that her job was to shred them. "The whole thing had kind of a feeling of the beginning of the Rumpelstiltskin fairytale where she has to spin all the stuff into gold — except that I was creating garbage," Butler says. Butler's novel The New Me explores what it's like to work in a dead-end office job. Her story focuses on a 30-year-old woman named Millie who wanders from temp job to temp job. "The reason to do work in the world of this book is only so you can have money so that you can buy a cardigan ... and go to yoga classes," Butler says. The slim, cynical book grapples with questions of ambition and adulthood. Butler says she wanted the novel to be both painful and funny. On imagining Millie as an "all-knowing gremlin"
She has this really ornate way of describing the world around her. She's very judgmental, and she's very hostile, and almost in a Dickensian sense. She really takes a lot of pleasure in describing the faults of others — and this is her main pleasure in life. But it makes her feel bad, because she can't have any friends and she can't do anything good for herself. It's a tension that sort of ends up infecting her body, too — her shoulders are always tight. She's always hunching and it's these little things that just sort of ratchet her up. I thought [there] was an interesting match about dead-end jobs and depression, and that's this feeling of endlessness and also complete lack of energy. ... When you're depressed, you remember that you've always been depressed, and you predict that you always will be depressed, and I think the same feelings come out when when work isn't going well, too. I will always have this terrible job, I've always been terrible, I'll always be terrible. ... I was interested in fusing those two things. On her own conception of "success"
I still feel skeptical of ambition. ... Something about it seems to miss the point of how we should experience life. It's helpful to have goals to work towards, and it's good to be working on a project that has inherent meaning, and to have relationships that have inherent meaning, but if your goal is to get status or achieve something, you might fail and then you'll feel terrible. Or, you will always be approaching situations with that in the back of your mind and it'll really sour your experience and stress you out. I just kind of want to be que sera sera about it — but also, I would like to, you know, be an adult. Mallory Yu and Jolie Myers produced and edited this interview for broadcast. Beth Novey adapted it for the Web.